1. 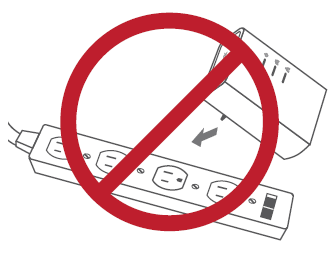 Connect Powerline devices to electrical outlets that are not controlled by a wall switch to avoid accidentally turning off power to the device. 2. Do not connect the Powerline devices to an extension cord, surge protec-tor, or power strip as this might prevent it from working correctly, or nega-tively impact network performance. 3. Avoid using the Powerline devices in an electrical outlet that is located near to an appliance that uses a lot of power such as, a washing machine or tumble-dryer, or a refrigerator. This may prevent the adapter from working correctly, or negatively impact network performance. 4. Verify that your Powerline devices are electrically rated to operate within the power available within your location. 5. To help prevent against electrical shock, be sure to plug the power cables into properly grounded electrical outlets. 147 people found this useful.